“Camping, hiking, fishing, boating…My parents raised me to be an adventurer,” says Skye McKinnell, a senior environmental science major from Salem, Ore. It didn’t take long for her to realize that she wanted a career where she could work outside. 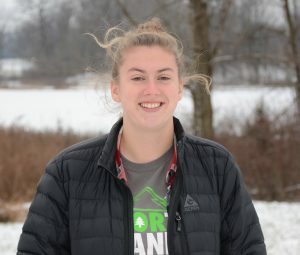 Including Merry Lea’s Sustainability Leadership Semester (SLS) in her academic program was a way Skye could study outdoors as well—and go on hikes every day. Students in the SLS live on Merry Lea’s 1,189-acre nature preserve where their cottages are surrounded by gardens and pocket prairies and their classroom is on the edge of a wetland. Students explore the local watershed by canoe and take many field trips. “I really liked the Sustainability and Regeneration course. We met outside for almost every class period. It helped the conversations we had feel real,” Skye says. One class period, the students met around a fire. In another, they met in Merry Lea’s bird blind. A third saw them ferrying recycled bricks in a canoe to create a reflective space near the students’ cottages. They never knew where they might end up for the next class. Sustainability and Regeneration also required an outdoor spiritual practice. Students were expected to spend a half hour a day on their own in nature at the same spot, observing. Skye chose a spot under a bridge where water enters Thuma Ditch from a slough. “I missed the sound of rushing water from back home,” she admits. In a policy course, students faced a very different assignment: they needed to pick an environmental problem in a particular place and come up with a policy solution. Skye drafted a recycling policy for her hometown. She appreciated being able to choose a location she cared about. A recent Chinese ban on low-quality recyclables provided a real-world challenge and required her to learn about tagging and inspecting recyclables, as well as the labor involved. Following graduation, Skye plans to return to the Pacific Northwest so that she can work with mountains and big trees. She may even have the chance to act on her work with recycling policies.